Hope’s Silvery trout fly or lure. The first day of October signals the start of another fishing season. 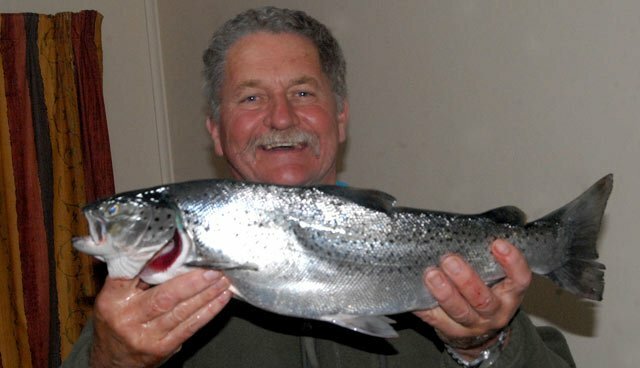 With it comes excellent sea-run trout fishing in our lowland rivers during the months of October, November and December. Some years they seem to arrive early season in the Rakaia and Waimakariri Rivers while other years the best fishing may not be until mid to late November. Sea-run browns come into the tidal reaches chasing the huge abundance of smelt (better known in Canterbury as silveries) which also arrive at this time of year. Trout caught often disgorge silveries when lifted from the water – their stomachs being packed to overflowing. Early season sea-run brown trout taken on a Hope’s Silvery that was fished on light spinning gear. An old and still useful method of fishing for sea-runs is to use a live lip-hooked silvery as bait. You don’t need to cast. Just use your leader, and perhaps a very small sinker, to let the bait drift down the current. Often sea-run brown trout will be caught at your feet in the discoloured water caused by melting snow in the distant Southern Alps. I have even felt trout touch the leg of my waders while fishing and they are frequently taken right at the rod tip as the fly is retrieved. So be sure to “fish your feet” first! The sea-runs will often chase the silveries into the bank. I have also seen anglers catch them between the bank and a line of anglers standing waist deep 20 metres further out! As any angler who has fished for sea-run brown trout will know it is not unusual to foul-hook a silvery on your streamer fly as you retrieve across and down the current. An old-timer, whom I would occasional fish within the Waimakariri River, showed me how he would take the foul-hooked silvery off, and then rub it on his Hopes or Yellow Rabbit to impart the distinctive cucumber smell of the silvery to his fly! Whether this helped or not I can’t say but this old bloke sure seemed to catch a lot of fish with very little apparent effort. The Hope’s Silvery is tied in the typical Matuku style. The original tie would have been quite bulky having a round torpedo shape. Tail: Grizzle tips. Body: White Chenille. Rib: Flat or round silver tinsel. Wing: 4 x Pale grizzle, or pale buff hackles, with light blue floss trapped under the ribbing.Topping: Peacock sword. I prefer the B175 Kamasan – Heavy Traditional Trout hooks which have been chemically sharpened. This sort of lure fishing for sea-run brown trout is usually done in Canterbury with an outfit similar to the following: 8 or 9 weight rod about nine feet in length, a medium to fast sinking fly line – I have used a Scientific Anglers Deep Water Express fly line for sea-run trout. This line is great for taking the lures down in the faster water near the mouth of the Rakaia River but it sinks too fast in the slower flowing Waimakariri River. Typically most anglers use a half ounce lead a metre or so above the lures to get them down near the bottom quickly. I say lures because most anglers use a two fly outfit where this is permitted. The lures typically used during the day and early evening are Hope’s Silvery, Taupo Tiger, Parsons Glory, and Yellow Rabbit. As nightfall closes in a darker lure is the better option. This creates a better silhouette for the trout to spot in the dark – or at least that’s the theory. How they can see, chase, and catch a small fleeing fish in the dark is truly a miracle of nature! Anyway, in the gloom following sunset, change to Black Rabbits, Hope’s Dark and Bob Bragg’s Red Shadow. This is by no means an exhaustive list of the lures used but is quite typical. It is also possible to fish this outfit on light spinning gear. Many anglers use their salmon rod and bait caster reel for this but an eggbeater reel will help avoid many of the inevitable tangles particularly if the wind is blowing. Tie on a #8 black swivel, then a half once D lead, then a second #8 black swivel. Then tie either one or two leaders about a metre in length to the bottom swivel and a lure to the end of each. 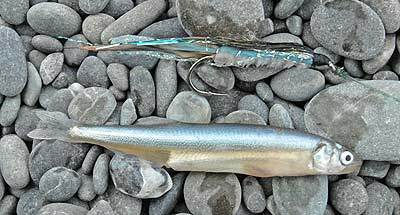 If you fish two lures stagger them so they are about 15 cm apart. With two lures you can try two different patterns to see which is the more effective. Lost lures will be inevitable when fishing for sea-runs because debris like half-buried logs, gorse bushes, tree roots, and sticks of all shapes and sizes will be littering the bottom. You get to know where the obstructions are and so avoid them. However, a fresh through the river will leave you back at square one. I note that with regard to these lure losses some anglers, my self-included, seem to be “unluckier” than others. While one bloke will lose his gear regularly throughout the evening, the bloke fishing next to him will go home with the same lures he started with hours earlier! If you are getting fouled in the same spot my advice is to move up or down river away from it. As an aside, whenever the river had dropped following a dry spell, an old mate of mine would always head over to these snags and take a look. It was amazing just how much gear he would pick up doing this! In popular spots, one snag alone could yield him 20 spinners and assorted flies! In any event, it is an added bonus if you can tie your own lures. That way a few losses here and there won’t bother you in the least. Another old rule of fishing seems to be that if you go down to the river with just a couple of lures in your box you’ll end up getting them caught in the willows on the opposite bank on your first cast. Whereas if you have plenty; you won’t lose any! Top the Common Smelt – Retropinna retropinna – and below it a Hopes Silvery trout lure. 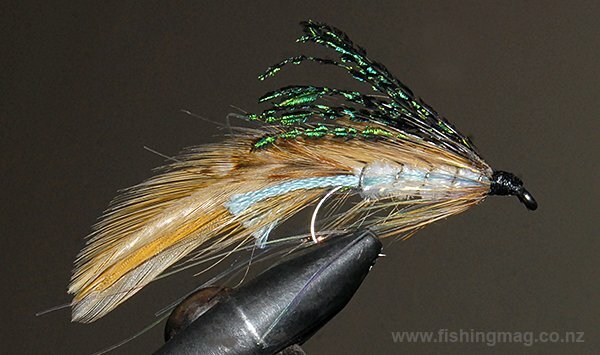 The Hope’s Silvery trout streamer fly pattern is a long time favourite of mine. As you can see from a quick glance at the photograph the Hopes and the real silvery look almost identical. The white body combined with the pale blue floss down the side, combined with the darkening of the “upper body” really brings the fly to life. Hopes Silvery Red. You could once find the red version of the Hopes in most Canterbury tackle stores. The original pattern calls for a wing of pale honey grizzle but the lure is just as effective with a plain pale honey coloured or slightly darker feather. I tend to use what I have available. You don’t have to be a slave to the exact pattern. I have even tied the Hope’s Silvery using a much cheaper strip of rabbit pelt for the wing instead of hackle feathers. I have fished these for many years and shared them with a couple of mates – they work just as well. The rationale here is that I can get the rabbit pelts for free! I also find the lure quicker to tie by substituting the hackles with rabbit pelt. Don’t be afraid to give your Hope’s a fat round body which perhaps better imitates the real thing. The early Canterbury lures tended to be tied with broader hen hackles and fat torpedo-shaped bodies. After all, as mentioned earlier, the rivers will likely be coloured so you want the big sea-runs to see your offering. 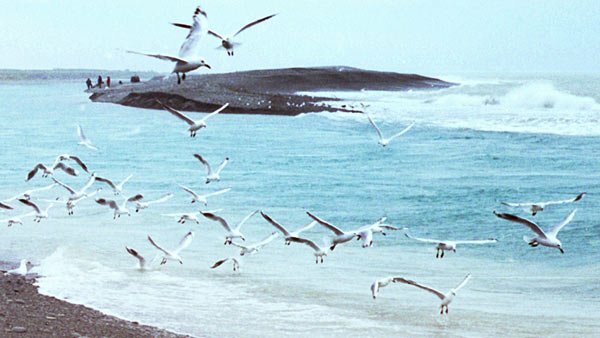 Gulls diving on silveries in the gut at the mouth of Canterbury’s Rakaia River. When you see the birds working hard like this just above the surface my first choice of lure would be a Hope’s Silvery. The Hopes is a typical Canterbury lure tied in the Matuku style with the added blue floss making the job slightly fiddler. After you have tied a few trapping the floss beneath the winds of oval tinsel becomes second nature. I tie my Hope’s Silveries on a Kamasan B175 in a size #2. This is quite a heavyweight hook but a double-figure sea-run brown in fast water could take some stopping. Plus there is always the chance you might hook a salmon or kahawai as well. When the rivers clear around Christmas time I would go smaller – down to a #8 if necessary to fool the fish. Also go down to a smaller hook if you find the trout are tugging your lure without being caught. The author’s Hope’s Silvery Rabbit Pelt version with Perl Crystal chenille body. You can also spiral wrap Perl Crystal chenille over a white chenille body. Don’t worry if it looks a bit bulky. The early versions of this lure were often tied with a bulky torpedo-like appearance. Advantages of tying your own lures include the ability to experiment as well as save money. The Hope’s Silvery is perhaps the best known of the Canterbury lures. It was designed to represent a small streamlined fish; the smelt (Retropinna retropinna). Best known as “Silveries” by most South Island anglers, smelt migrate from the sea, in spring and early summer, into our rivers to spawn. Sometimes they appear in huge numbers, especially prior to Christmas. Having spawned the smelt die. They grow to a length of about 75 mm or three inches. Whitebaiters also catch quite a few silveries in their nets. It is important that whitebaiters return unwanted silveries to the water. These little fish smell like cucumber. Sometimes anglers call them “cucumber fish.” Strangely, many silveries become impaled on the fly as it is stripped through the water. I believe this is because they attempt to shoal with the lure and get too close. At times their numbers are so dense you hook one silvery on nearly every retrieve. Old hands sometimes rub their first silvery caught in this way on their lure to impart the smell and so increase the lure’s appeal to the trout. During their journey up-river vast numbers of silveries are eaten by smelting trout. Many of the brownies caught in the lower reaches of the Rakaia, Waimakariri, and other Canterbury and Otago rivers, are so stuffed full of silveries, they disgorge them in great quantities over the stones upon capture. On opening, the stomachs of these fish are found to be packed to the brim with smelt. They provide such a good food source that many trout grow fat, with characteristic small heads and think, deep bodies for their relatively short overall length. Such is the food value of smelt to trout at this time of year. Terns and gulls circle and screech in noisy packs above the fast-moving shoals of silveries. This is a great sight to be greeted with upon arrival at the river because trout are also harrying these shoals from below. There is no need to fish deep. The smelt seem to take a shallow path upstream, hugging the edges in their attempts to avoid being eaten by trout. The approach of darkness emboldens the brownies who then don’t hesitate to chase silveries through the shallows. Often with their backs out of the water, as they shoot through the shoal after an easy feed. Standing in knee-deep water, in the Waimakariri River, I have had brown trout rise at my back between me and the dry stones, only a few feet away. When fishing to smelting trout in Canterbury’s snow feed rivers I prefer the Hope’s Silvery, though many other patterns appear equally effective particularly the Yellow Rabbit and the Taupo Tiger. The author Allan Burgess with a good sized sea-run brown trout. These fish fatten up quickly in the spring on a diet of whitebait and smelt. Many would argue that it isn’t the lure but the way it’s retrieved that makes all the difference. I have fished with a few real experts at sea-run trout fishing and can testify that this argument is not without substance. I have seen good anglers continue to take trout after trout on lures that were so chewed up by fish caught earlier that the lure was just a bit of rabbit pelt and a hook. All the fur and tinsel had long gone but the “lure” continues to take fish after fish! David Hope, who was the curator of the North Canterbury Acclimatization Society during the 1920’s and a well known Canterbury angler, evolved his Hope’s Silvery for smelting trout. Body; white wool or chenille, and either pale blue floss or wool. Tail; tip of barred rock feather. Wing: pale honey grizzle. Topping: of green peacock sword. Hooks: Mustad 9672: size 4. Like many fly tiers, I enjoy imparting my own interpretation to flies. For the Hope’s Silvery I prefer to use brown rabbit skin for the wing, if for no other reason than ease of tying. It makes no difference to the trout. The wet rabbit skin wiggles through the water with a very fish-like sinewy appearance. The Hopes Silvery pattern is a good match for the real thing. Another variation I like to fish is the same tie except for the substitution of the pale honey grizzle hackles with black hackles or black rabbit skin. The Hope’s Silvery then becomes the Hope’s Dark. This I pass off to the brownies as a night fly with more than acceptable results. The trickiest part for those new to this pattern is the wrapping of the blue wool or floss under the silver ribbing. I use the wool and find this easier. The secret is to keep the wool tightly pinched behind the bend in the hook for the first few turns and then you’re away. When the rivers are very low, and clear, try this pattern, sparsely tied, on a size 6 or 8 lure hook. However, for the most part, the Hope’s Silvery is more often fished in discoloured water. For this reason don’t be afraid to give the lure a fat torpedo-shaped body – which is how it was tied originally. I hope you enjoy tying and fishing the Hope’s Silvery. If you live in the South Island and lure fish the estuarine reaches of our rivers for sea-run brown trout this pattern is a must.